A little over two hours into Bloodborne and it would appear to the casual observer that I've made basically no progress in the game. I'm still standing at the first save point, I only have a few items on hand and the blood I've collected, this game's form of currency, is effectively zero. Yep, this is definitely a From Software game, positively dripping with the same DNA that pumps through the Dark Souls universe. Progression in any modern From Software game takes two forms. There's the progression that happens in-game; from the items you collect, to the bosses you beat and the new areas you're able to explore. Then there's the progression that happens in your own head. These types of games are built on a punishing foundation of trial and error, where your willingness to learn from your mistakes is as important as a mighty new weapon. Memorize where your enemies are, how they attack, and what tactics work best against them and, the next time you die and have to run through that area again, you'll likely make it just a little bit further. 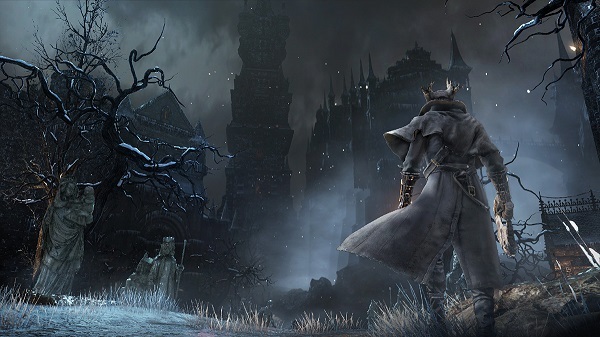 Bloodborne is deceptively similar to it spiritual predecessors, the Souls games. The mechanics are almost identical. The items you pick up simply look different and go by a different name, but you know exactly how they work. Even the NPCs you run into deliver their lines in the same otherworldly tone. But despite all of those similarities, we're actually dealing with a very different beast. Much like the first time I played Demon's Souls and had to force myself to abandon the run-and-gun style modern games have programmed into my muscle memory, I'm having to completely relearn what I assumed would be the proper tactics for playing a From Software game. For starters, I was always a sword and shield user in the Souls games, barely taking a step in those worlds without a shiny piece of metal held up between myself and the various monsters. In Bloodborne, your best defense is often a heavy offense. You're given two weapons to start, one for each hand, which should have made it clear from the get-go that I would need to play a more aggressive style of game. It's taken two hours to get that into my head, as I've spent much of that time dancing around my enemies, worrying too much about finding holes in their attack patterns rather than just finishing them off before they had the opportunity to notice me. You can also regain a bit of health if you stay aggressive, with a section of your lifebar up for recovery if you manage to land a few blows immediately after being attacked. Thanks to my Souls training, I've spent a lot of time backing away and hiding when I take a big hit. I'm slowly but surely breaking myself of that habit, too, trying to get it through my head that a wound should be immediately answered in kind. Enemies also behave a bit differently in Bloodborne and gave me a few opportunities I wasn't expecting. They'll move around the area in packs on set patterns, or just mill about from time to time in big groups. Rather than rush into battle, I'm finding that it can often be easier to let the hordes move past, then run right past them undetected. Similarly, you're given the ability to chuck a rock at individual enemies, drawing them to you one at a time rather than trying to kill them all en masse. Like the Souls games, killing enemies gains the in-game currency, which is blood rather than souls this time around. Also like those earlier games, dying means that you lose all of the currency you've earned up to that point. However, if you can make it back to that point before you die a second time, you can reclaim your lost treasures. That is why I say I'm standing at the first save point with basically no progress showing on the screen. I got cocky in an area I've been breezing through for a while now, I died, and now all of my blood is just sitting there on the ground, waiting for me to come and reclaim it. I haven't played Bloodborne long enough to form any sort of opinion on the game, but I love the direction its heading. I feel like someone took the systems of one of my favorite modern series and wrapped it in the gory, drab setting of some of my old-school favorites, like the original Resident Evil, Silent Hill or the strikingly similar forgotten action game, Nightmare Creatures. It's clear that I've got a long, punishing road ahead of me, but it's one I'm eager to keep following.